When connecting to an Ethernet printer you need to assign the printer a unique IP address. For now we can leave this page as is and come back to it once we configure the printer. To begin we will need to find an IP address that isn’t being used by another device. 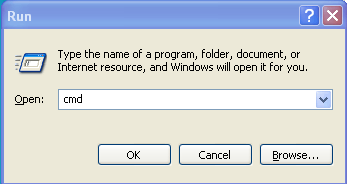 For this you will need to open a command prompt. Press [Windows key] + [R]. This will open the run command window. Type cmd in this window. This will open a command prompt window. Type in “ipconfig” in the window. The green arrow marks your subnet mask, this identifies the portion of your IP address that is your network ID using the 255 and the rest indicates the host ID using the 0. Your subnet mask will determine what portion of your IP address is the network ID and what is the host ID. You can use 1-224 or 226-254 for the Host ID assuming that those addresses are not in use. To check if an address is not on in use, you can use the ping command. For the purpose of this explanation, lets use 192.168.1.222. Type “ping 192.168.1.222” as shown in the picture below. Now I am going to try a different address to see if it is taken. Since the request timed out that means this IP address isn’t being used. Which means we can use this IP address. 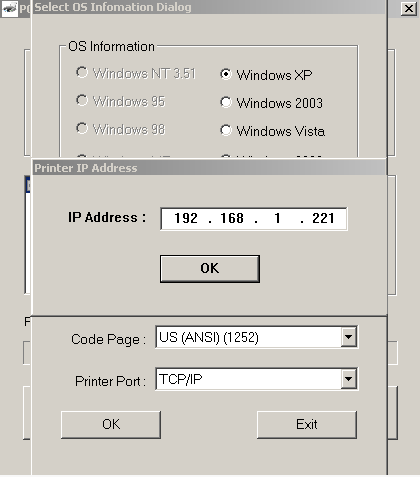 Now lets change the IP address of your printer, to an IP address that isn’t being used. In my example 192.168.1.221 isn’t being used so I will use that. To change it I will use the configuration utility. Once you click on search you will see an item listed (possibly more if you have multiple Ethernet printers) indicated by the red box in the image below. Once you click on one of the items. It will populate some information. 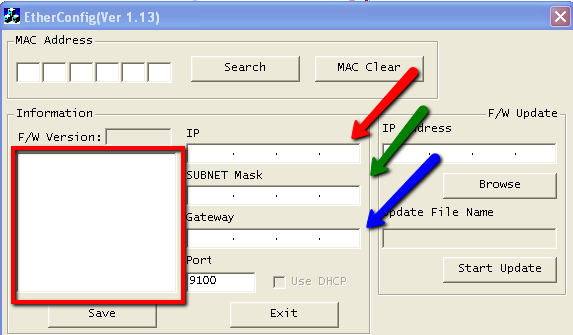 Here you will change the IP address, subnet mask, and gateway to match your network. Add the the information based on the arrows. Red- Add the IP address that is not being used by another device. Now select Save this will change the settings on your printer. Now you can open up a command prompt or go back to the command prompt to run the ping command one more time. Now that we have the printer’s network settings configured we can install the driver. We will use the IP address from my example, 192.168.1.221. Change it to the IP address you are going to be using. In my example I will change it 192.168.1.221. And select OK.
Click on the picture to move on to Step 2.